In his post on the enforced disappearance, torture, and arbitrary killing of Giulio Regeni, Luca Pasquet quoted the annual report of the United Nations Working Group on Enforced or Involuntary Disappearances (WGEID), where concern is expressed in relation to what “seems to be a recent pattern of short-term disappearances” in Egypt (UN Doc. A/HRC/30/38, para. 67, emphasis added). However, the phenomenon of “short-term disappearances” is not unique to Egypt and has been the source of concern for international human rights mechanisms at least over the past ten years. In the above-mentioned Annual Report, the WGEID informs that from 17 May 2014 to 15 May 2015 it observed a pattern of “short-term” enforced disappearances being used in a number of countries, and expressed its deep concern in this regard (para. 102). In the same report explicit reference is made to the practice of short-term enforced disappearances in Bahrain (para. 59). In the Annual Report for 2014 (UN Doc. A/HRC/27/49, para. 117), the WGEID observed a pattern of short-term enforced disappearances in Bahrain and the United Arab Emirates). Moreover, the WGEID stressed that “there is no time limit, no matter how short, for an enforced disappearance to occur and that accurate information on the detention of any person deprived of liberty and their place of detention shall be made promptly available to their family members” (UN Doc. A/HRC/30/38, para. 102). Il 9 e 10 giugno l’Università di Parma ospiterà il XXI Convegno SIDI, sul tema “La tutela della salute nel diritto internazionale ed europeo tra interessi globali e interessi particolari”. 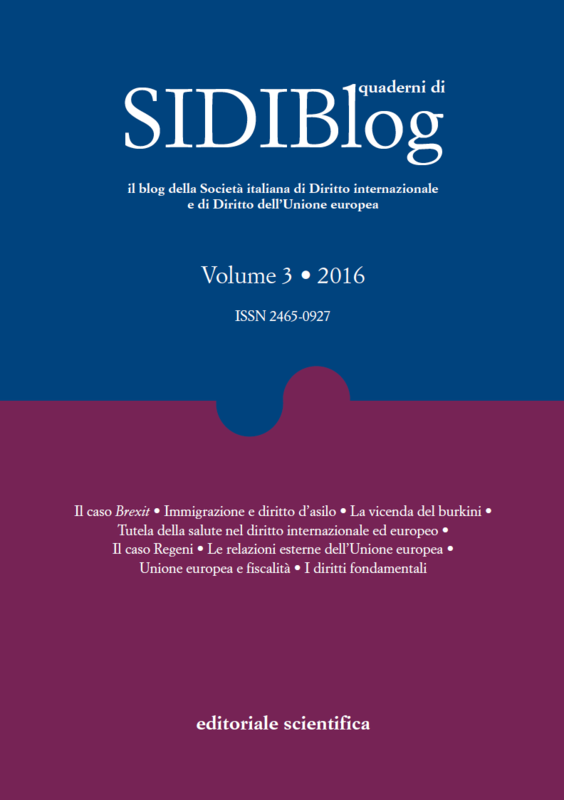 In vista di questo appuntamento, il SIDIBlog, rinnovato nella sua veste grafica, è lieto di ospitare – in un’apposta sezione denominata “SIDIpost” – una serie di contributi, inizialmente inviati in risposta al call for papers per il Convegno e segnalati a tal fine dagli organizzatori e dal Consiglio direttivo della Società.